In some ways I like pepperoni pizza pasta better than pepperoni pizza. It is definitely lighter and more healthful. This pasta dinner includes many of the things that are great on a pie, including basil, mushrooms and Parmesan cheese. I came up with this recipe thinking about what to do with leftover pepperoni from making pizza. I like the texture and green color the broccoli adds. 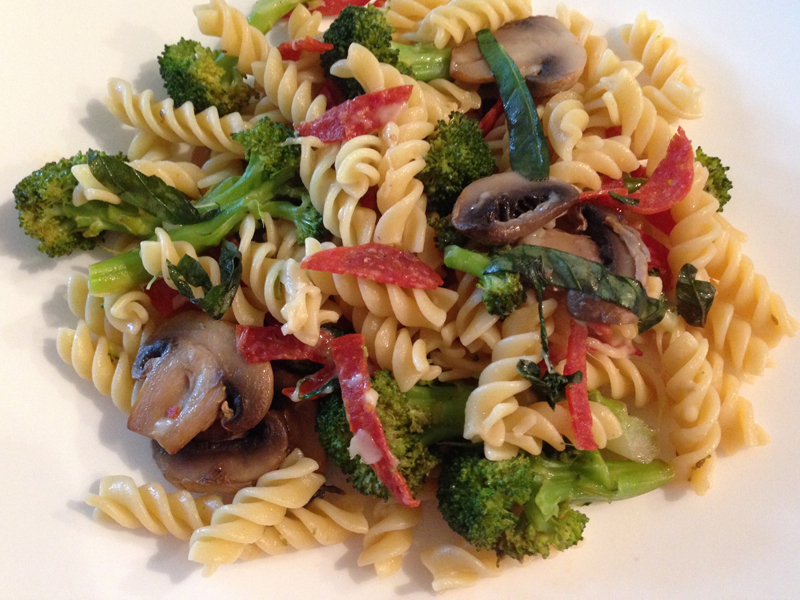 I’ve made this recipe with spiral and penne pasta, and I prefer the spirals. Fresh basil is a must for this dish. I use my homegrown crop. While the pasta cooks, prepare the rest of the ingredients. It’s an easy, 20-minute meal. Boil water for the pasta. Prepare pasta. While the pasta cooks, place the broccoli in a non-stick pan over medium low heat. Stir occasionally. Add the mushrooms to the pan after the broccoli cooks for a couple of minutes. Add the pepperoni once the broccoli and mushrooms appear about halfway cooked. Stir occasionally. Once the veggies are cooked, reduce heat to low. Once the pasta is done and strained, add it to the mixture. Stir in the basil and half of the Parmesan cheese. Serve and top with remainder of cheese, as desired. No Replies to "Pepperoni pizza pasta with broccoli and basil"